Lithophanes are an old artform that I am now experimenting with using entirely new methods. (Click here for a fuller history). First mentioned circa 1825, this process involved carving a picture out of wax, then, using a lost-wax casting process, the picture was finally cast in porcelain. Light then transmitted through the reverse “bass-relief” porcelain was seen as a picture. Dramatic and popular for it’s time. My brother, Ray, has a woodworking business and we have been collaborating for a short time on a new wrinkle on Lithophanes. 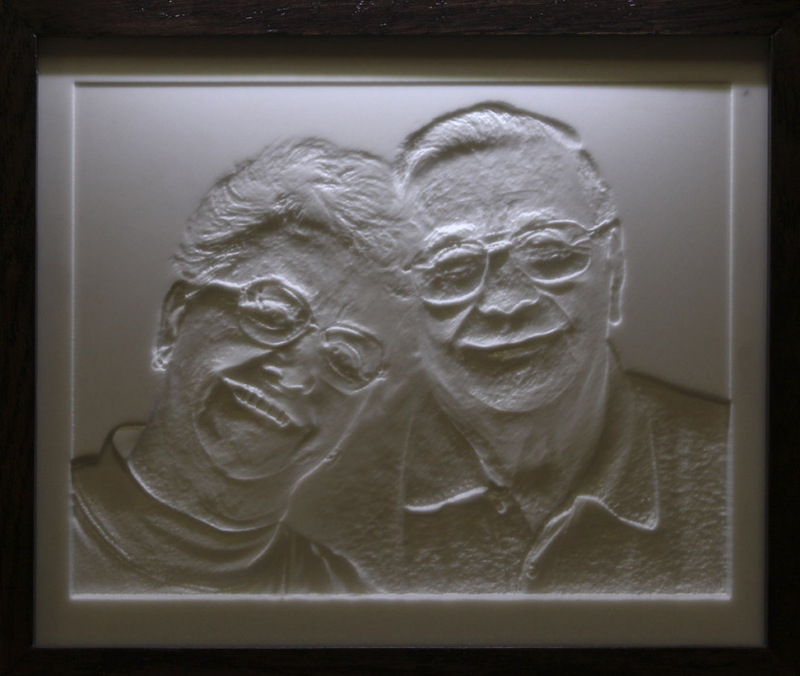 Using high-resolution photography coupled with sophisticated software to translate specially prepared bitmap images into the code for a CNC Router, we can carve the following Lithophanes. 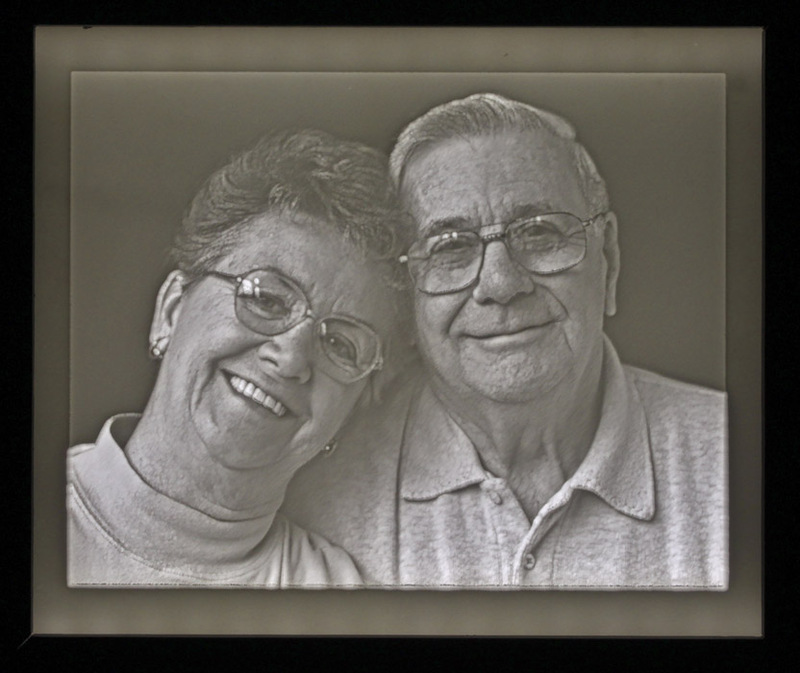 It is very difficult to see the “wow-factor”of the Lithophanes from a web page’s photograph or animation, but these are actual photographs taken of a Lithopane carvings. In person they are quite impressive, tactile and everyone goes, “Wow”. We can have things carved at nearly any size up to 6ft. x 8ft. Add LED backlighting panels and you have the makings of a new media which hearkens back to an obscure past. We use digital photographs and computer numerical controlled (CNC) machine routers that “carve” relief into Coiran-like materials and PVC. Adapting the photographic process as well as the software for the routers, we have been able to achieve dramatic results. The results are photographic and a result of the various depths of the material blocking or allowing light to transmit through the Corian. 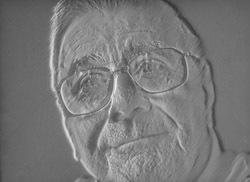 An “Object-VR” showing the transition of a Lithophane from front-lighting to back-lighting. 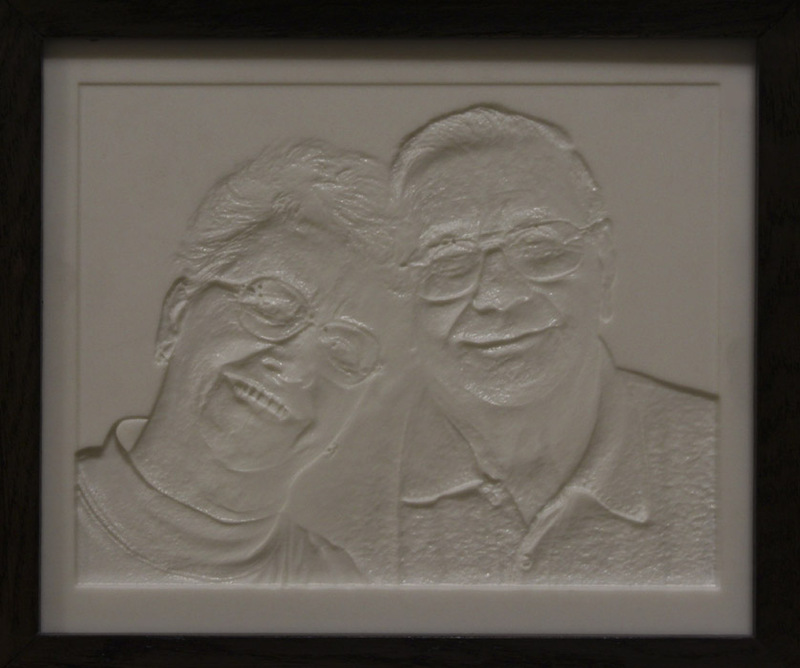 Lithophane interactive example. Click on image to open a VR-Object page. Place your cursor on the VR-Object and click and drag to animate the image.